A gritty, hard-at-it midfielder, Vandenberg took a while to develop into an important senior player after being picked up with the 78th pick in the 1997 National Draft. A New South Welshman by birth, Vandenberg came to Melbourne and tried to get on the Carlton list before playing with the University Blues in the VAFA. Thought of as a defensive midfielder who worked hard, Vandenberg struggled to get senior games until the end of 2001 where his form skyrocketed to the point where he was one of our best in the finals series. 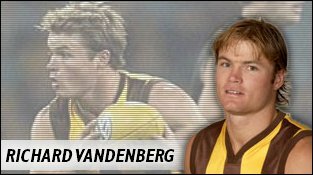 A big pre-season in 2002 led Vandenberg to increase his leg speed to the point where he was one of the quickest at the club, and with confidence from the match committee he was a vital cog in the improved Hawthorn midfield. Injuries hampered the start of his 2003 season, but a return to fitness and form coincided with the club's revival, and by season's end Vandenberg was edging closer to his very best. Vandenberg provided a rare highlight in 2004 for Hawthorn fans, when he beat the living crap out of Adam McPhee during the brawl against Essendon. The Butcher earnt 6 weeks for the indiscretion, but plenty of new fans. Butche was made captain at the start of 2005, and although he had his critics for his limited ability, his hard work and leadership was valued in a young side. He struggled through injury in 2007, but managed to have a fitting send off, thrashing Andrew McLeod in a finals match before retiring the following week after a loss to the Kangaroos.